Ashley, from The Shine Project(go there after reading this!! ), tweeted last week about needing some help with a project. You can see where to buy these shirts below! Of course, I tweet back and I receive a lovely little email from her. She explains that she needs us to write a post today on said project. At this point, it's killing me! I am so excited to know, but she hasn't let me in on it yet. Well I got that email the other day, and immediately told my boyfriend. Let's say the person behind me was you, you would pass it forward to someone else, and then would go home and do the same thing. 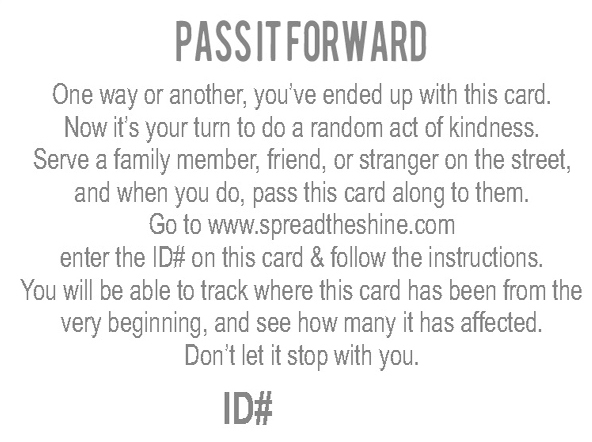 From the very beginning, you will be able to track where your card goes, and how many people you affect just by doing one simple act of kindness. 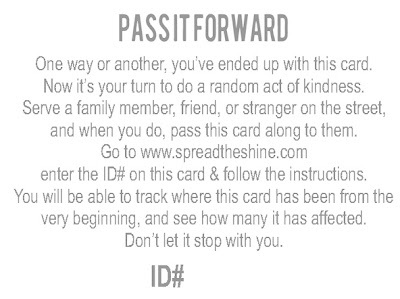 I love this project and I cannot wait to get my card in the mail and begin! I promise that I will post about what I do...and who knows...maybe YOU will see my card! 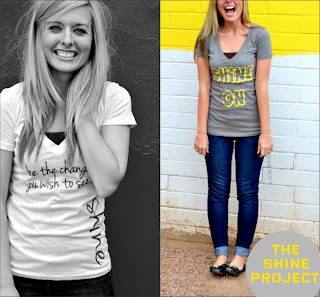 Please go check out Ashley's page, she has some great merch, and she is doing so much to change the lives of those around us! so excited you are a part of this, too!! :) have a great weekend!!! I know! This is going to be such a fun thing! I'll get you some cards, or give you a few of mine!